Four yellow brick buildings, two on each side of Main Street, anchored McFarland’s early business district. In the large mural, the first building on the west side, dated 1897, was constructed by Ole S. Olson and was started as a general store. Built with a partition, the south end became Fred Hubberd’s Dry Goods Store and H. C. Kleine’s Hardware occupied the north end. See photo above. The sign on the door advertises a dentist who came from Stoughton and worked part time in his office on the second floor around the turn of the century. The yellow brick building to the north was home to the business ventures of Tollef Lewis. He combined undertaking with a barbershop and furniture store. Furniture for sale was up front with the barbershop partitioned off in the back of the store. The caskets were housed upstairs. There were no stairs, only an elevator operated by a rope. At that time embalming was done in the home of the deceased. The wooden building on the end was once a post office and a shoe repair shop. 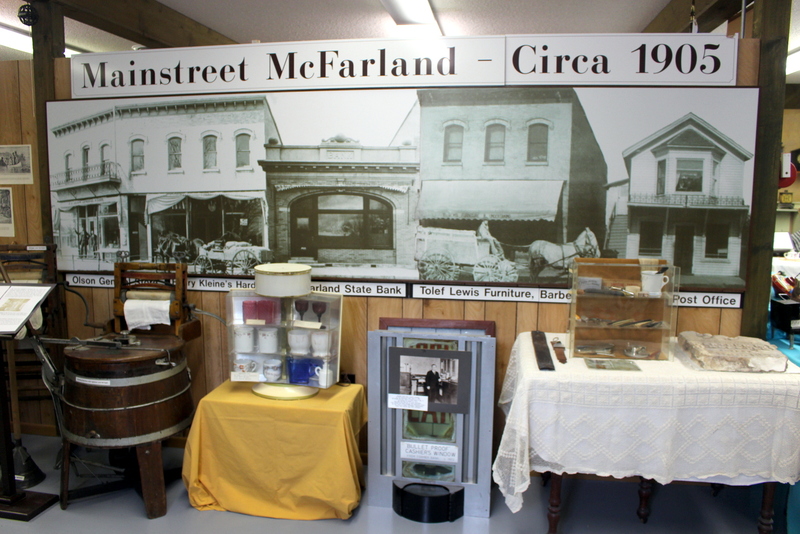 The site is now the home of this McFarland Historical Museum. Wooden posts with pipes formed a hitching rail between the businesses and the dirt road for tieing horses while the owners did their shopping. Most of the merchandise sold in these stores came into McFarland on the train. Goods had to be picked up at the depot south of the railroad tracks and east of Main Street.